If losing one or more teeth to decay or gum disease has you worried about your smile—or if you’re struggling to eat your favorite foods and speak clearly because of lost teeth—our office in Fairfax Corner can help. We offer several varieties of partial dentures and full dentures, both common ways to replace missing teeth and restore your smile’s natural function and beauty. Custom-made dental appliances called dentures restore missing teeth. They’re constructed of artificial teeth and gums that match the shape, color and translucency of your natural teeth. They attach to a removable frame or a permanent dental implant (an option that keeps your teeth in your mouth instead of on your bedside table). In addition to replacing lost teeth, dentures support your facial structure and boost your confidence, making them a valuable investment in your long-term dental health. Patients who have lost a whole row of teeth along the upper or lower jaw are good candidates for a full denture (also known as a complete denture). This replaces all of your existing natural teeth in the upper or lower arch. A removable full denture rests on the gums and holds in place with natural suction or dental adhesive while a fixed full denture anchors to your gums and jawline through dental implants. If you have one or more missing teeth surrounded by healthy adjacent teeth, you might like a partial denture. This acts similar to a bridge, except it’s designed to be removed daily for good hygiene. A partial denture hooks on to the supporting teeth with clasps, which can be either metal or a more aesthetic material. With implant-supported dentures, dental implants provide the stability and snug hold instead of suction or dental adhesive. 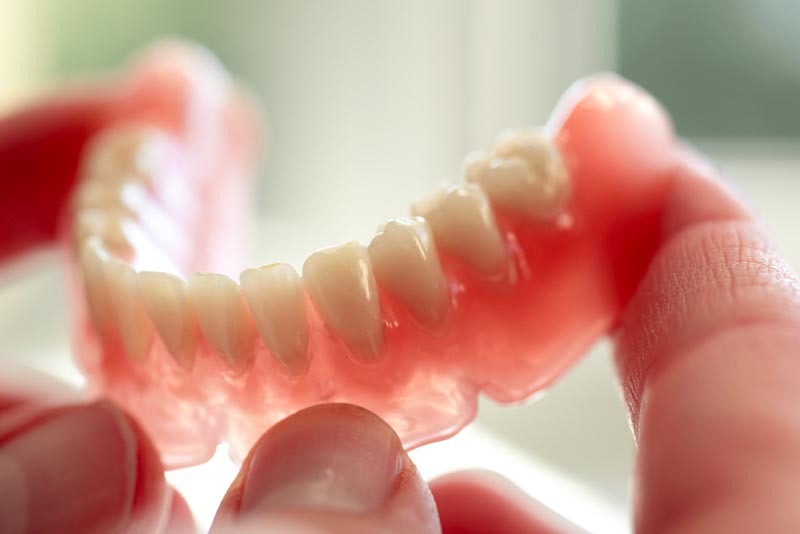 These dentures can be removable or permanent. Removable implant-supported dentures can attach to as many as five dental implants surgically inserted into your gums or jawline using a ball-and-socket method or a series of clips along a thin metal bar. A permanent denture or fixed denture snaps securely to two, four, or more implants and is removable only by a dentist. Your overall oral health, the type of dentures you choose, and the preparation needed all impact the process of getting dentures. Our dentist in Fairfax Corner will first assess your teeth and gums and discuss which options are most appropriate for you. We’ll then take measurements and molds of your mouth so we can accurately replicate your bite. We’ll provide you with a temporary denture to wear if needed until your custom denture is ready. Once your dentures have been fabricated, we’ll then work with you to make whatever adjustments are needed so your replacement teeth work and look as good as they feel. If you experience any pain or soreness with your dentures over time, our office can help with that, too. We provide a soft denture reline, an in-office procedure where our dentist adds a soft, rubbery substance to a denture’s hard interior. This pliable material can relieve pain and sore spots for up to two years. To help you make an informed decision about getting dentures, our friendly staff can provide you with an estimate that takes your overall treatment plan and type of dentures into account. We’ll also talk with you about how to obtain affordable dentures that meet your particular needs. We understand that accidents can happen. A removable partial denture or full denture may be dropped, stepped on, or otherwise damaged. Plus, normal use can cause wear and tear over time leading to cracks or causing one of the replacement teeth to come loose. We invite you to bring your denture to Smiles at Fairfax Corner for denture repairs. Even if you didn’t purchase your denture through us, we can help get it fixed for you. To learn more about dentures, or to get started on restoring your smile, call our office in Fairfax Corner today at (703) 997-0928 to set up an appointment.